Rainwater is collected from the roof drainage system by the underground Wisy WFF vortex filter (1) or filters (1). This filters out the debris from the water and diverts about 90% of it into the storage tank. The remaining water goes to soakaway or storm drain in the usual manner, as does the excess water from the tank. As water enters the tank it passes through a calmed inlet (2) which calms the flow of water and prevents disturbance of the float switch and any sediments. Water is then supplied on demand by the submersible pump (3) through a floating suction filter (4) to the header tank and so to WCs etc. The pump is controlled from a panel (5) that receives inputs from a float switch (5a) in the header tank to detect demand, and a float switch (5b) in the rain tank to provide dry-running protection. Main water top-up is provided by a solenoid valve (6a) activated by a third float switch (6b). The water is discharged via a type AA air gap in accordance with current water regulations. The tank then supplies the WCs under gravity. 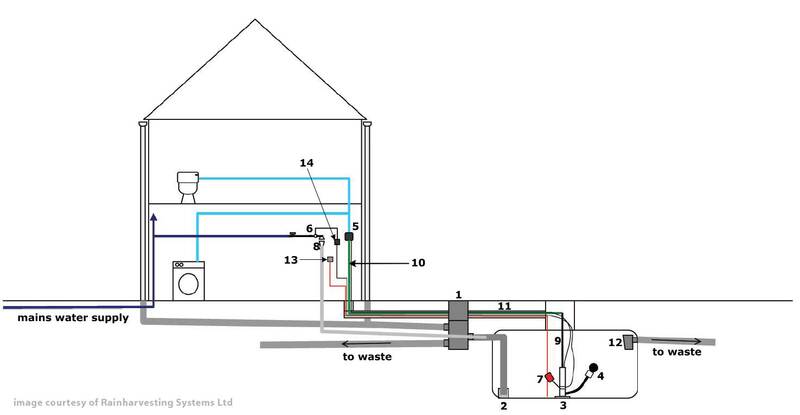 Pressure hose (7) and cables are ducted to the building through a 110mm drainage pipe which acts as a duct. An overflow trap (10) provides a water seal against any foul odours from drains. N.B. - anti-backflow and anti vermin version are available if required for connection to a foul sewer or similar. An optional level gauge (11) gives a visual indication of tank water level. With smaller tanks (<4000 litres) a fixed suction filter is used in place of the floating version (item 4). Standard Header tank sizes are 25, 50, and 100Gals.